Facebook is to make changes in News Feed to relegate engagement bait. Facebook is gunning against a new kind of spam, engagement bait. Engagement bait is the posts in which people desperately ask people to Like, Share or Comment on the post to increase the number of users engaged. You must have seen the post, which asks you to Rate a look or comment to tell which dog is cuter in the picture. This is a popular way for publishers to grab attention by using Facebook’s algorithm. HOW IS FACEBOOK GOING TO STOP IT? Facebook is hell-bent on not letting the publishers gamble its system this way. Moreover, the company mentioned in their blog, “People have told us that they dislike spammy posts on Facebook that goad them into interacting with likes, shares, comments, and other actions.” This suggests users get annoyed by these spammy post. See Also: Is Facebook Going Too Far With Its Identity Checks? So from this week onwards, Facebook will be putting the leash and will demote engagement bait in News Feed. In addition to this, in coming weeks, pages and publishers still indulge in these activities will notice their reach decreased in all their posts. However, the post asking for help, recommendation or advice will not be negatively influenced by the update. Facebook is continuously working on putting a check offensive or unnecessary content. Earlier, Facebook promulgated an algorithm change intended to display more videos on user’s feed. Moreover, it has also banned other types of spam posts such as clickbait. Though, it is still not clear whether all this is working or not. As Facebook is making algorithm tweaks to fight spam, this means Facebook is still struggling with spam. Given the control that Facebook has on User’s News Feed, it is safe to say that there is less spam than yesterday. With this move, Facebook desires to grow genuinely of posts that appear on people’s news feeds. The Chair of the National Data Protection Commission of France has ordered Whatsapp not to share user data with Facebook. CNIL, Chair of the National Data Protection Commission of France has instructed Whatsapp to not share user data with its holding company Facebook. The application has been given a month to abide by the order in a public notice. WHY WAS THE NOTICE PASSED IN THE FIRST PLACE? 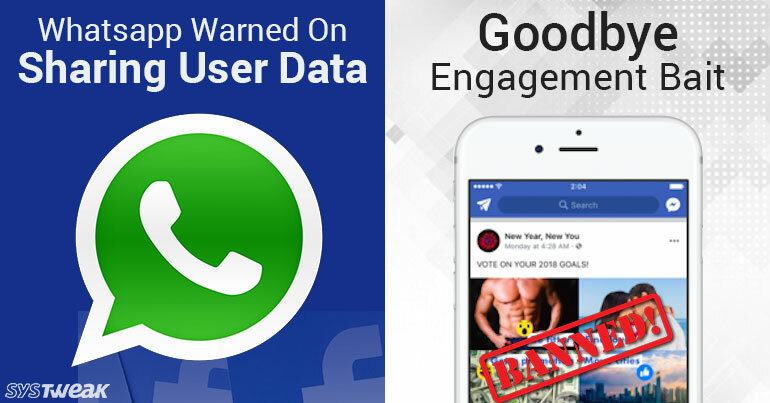 It all started when Whatsapp included in its terms and conditions that it shares data with Facebook for security measures, develop targeted advertising, business intelligence and more. When CNIL investigated, it found out that Whatsapp was indeed using it for enhancing the security measures but the app’s business intelligence reason isn’t valid. HAVE THESE SOCIAL MEDIA GIANTS NOT LEARNT ANYTHING FROM PAST? This order has proved that the social media giant has not learnt from its past mistakes. Despite the several warnings, it has been repeating the same mistake over and over. Facebook has been trolled for data sharing by European regulators earlier as well. Germany has ordered Facebook to not collect data from Whatsapp users in September 2016. In the UK, Facebook concurred that it will not collect user data from Whatsapp in November 2016. In May 2017, Facebook was penalized and asked to pay $122 million by the EU as the company provided misleading information under which it claimed that users would be able to link their Whatsapp to Facebook. The list goes on. Facebook and other social media giants should not violate policies and rules levied to protect fundamental freedom of users.